We’d love your help. Let us know what’s wrong with this preview of Exit Strategy by Colleen Cross. Fraud investigator, Katerina Carter just doesn’t know when to quit, which lands her in some pretty messy and precarious situations. Now that’s she’s out of work and running out of money, Kat needs to get more clients, or she’ll be forced to go crawling back to a cubicle at her previous firm. And to Kat that’s a fate worse than debt. So when Liberty Diamond Mines CEO Susan Sullivan hires Kat to find Liberty’s missing CFO and a large sum of embezzled money, she’s a little too eager to accept the job. Abject poverty is a great motivator for taking hard cases, but her excitement soon turns to terror when two employees of the company are brutally murdered. Kat realizes that this investigation might be more dangerous than she expected.As if things weren’t complicated enough, she uncovers a sinister connection between blood diamonds and organized crime. All she has to do now is get proof--and keep from getting killed before she exposes the real criminals. With the help of her friends and an eccentric uncle, Kat had better tread carefully or her first case might also end up being her last. . . Please scroll up and buy a copy today! A fast-paced financial and legal thriller that will appeal to fans of Michael Connelly and John Grisham. Exit Strategy by Colleen Cross and narrated by Peters Burchard is an audible book I requested and the review is voluntary. This has suspense, a mob boss and his daughter to deal with, illegal diamonds, kidnapping, murder, and money laundering! I did learn a lot about illegal diamond trading too. This was a fast paced, with constant on the go action and adventure that I had to listen to all in one sitting. Can't wait for more in the series! Great characters and excellent plot. The narration was b Exit Strategy by Colleen Cross and narrated by Peters Burchard is an audible book I requested and the review is voluntary. This has suspense, a mob boss and his daughter to deal with, illegal diamonds, kidnapping, murder, and money laundering! I did learn a lot about illegal diamond trading too. This was a fast paced, with constant on the go action and adventure that I had to listen to all in one sitting. Can't wait for more in the series! Great characters and excellent plot. The writing was okay, although midway through, words were dropped from sentences. The minutia dragged the pace to a crawl. The repetitions made it hard to finish. I have to be honest 2019 is starting off on a bland start for me. I am certified to investigate fraud... in a past life I investigated insurance fraud. So of course I loved the premise of this book. When I finally decided to read it... I felt... not much. There is a lot going on in this book... I mean a lot... mob bosses, diamonds, illegal stuff, more illegal stuff... oh wait a twist more mob boss stuff... I mean like I said the book is fast paced but that is because there is so much going on yo I have to be honest 2019 is starting off on a bland start for me. I am certified to investigate fraud... in a past life I investigated insurance fraud. There is a lot going on in this book... I mean a lot... mob bosses, diamonds, illegal stuff, more illegal stuff... oh wait a twist more mob boss stuff... I mean like I said the book is fast paced but that is because there is so much going on your brain is in overdrive to keep up with it all. Goodreads Author, Colleen Cross introduces readers to a wonderful new protagonist, Katerina Carter. The forensic account slightly reminds me of Kinsey Millhone. Kat is broke, living in her office, and her ex-boyfriend is in her life more than she wants him to be. She finally has a case. Liberty Diamond Mines’ CFO has disappeared along with $5 Billion dollars. She stumbles on a diamond laundering scheme at one of Liberty’s mines, before a major stock holder is murdered and a former geologist refu Goodreads Author, Colleen Cross introduces readers to a wonderful new protagonist, Katerina Carter. The forensic account slightly reminds me of Kinsey Millhone. Kat is broke, living in her office, and her ex-boyfriend is in her life more than she wants him to be. She finally has a case. Liberty Diamond Mines’ CFO has disappeared along with $5 Billion dollars. She stumbles on a diamond laundering scheme at one of Liberty’s mines, before a major stock holder is murdered and a former geologist refuses to speak to her again. Kat suspects the recent murders and the threatening note found with her dead cat: Dead Kat are connected. The evidence of the theft is too easily traced to Paul Bryant and the over production of diamonds the company has reported. But when Kat becomes a suspect in one of Liberty’s insiders, she must face the reality that her theory of conflict diamonds being laundered by her employer may be right on the money. Firing her is one thing, but being set up for murder or worse is not an option. She has to find the money. The money will lead Kat Carter to the killer/thief and will answer the why. But can she? And who can she trust? Kat doesn’t have much time to solve a case that she’s not being paid to work on. The Liberty Diamond Mines Board meets in a few days and is moving closer to Kat. Recommends it for: Pretty near anyone. Don't think kids or YA would be interested due to financial theme. I had no idea what a forensic accountant was until reading this novel. (Such an accountant tracks down missing money in cases of financial wrong-doing.) I certainly had no idea that a story about a forensic accountant could be exciting, suspenseful, and scary. Forensic accountant Katarina (Kat) Carter is called in when five billion dollars goes missing from a Canadian corporation mining diamonds. She can't figure out why they called her. She's the least important investigator of her kind in town, I had no idea what a forensic accountant was until reading this novel. (Such an accountant tracks down missing money in cases of financial wrong-doing.) I certainly had no idea that a story about a forensic accountant could be exciting, suspenseful, and scary. Forensic accountant Katarina (Kat) Carter is called in when five billion dollars goes missing from a Canadian corporation mining diamonds. She can't figure out why they called her. She's the least important investigator of her kind in town, and everyone believes the missing CFO did it, anyway. But Kat needs the money, so she takes the job. An exciting story unfolds. Kat is a more-than-spunky modern heroine who refuses to quit when everything turns against her. Soon, we're learning about the international laundering of dirty diamonds, how pilfered money is moved between nations, drug lords, and big time organized crime. Kat's computer skills are reminiscent of Lisbeth Salander's in The Girl with the Dragon Tattoo. A great, fast-moving tale that will teach you more about forensic accounting than you knew existed--but in an entertaining and easily understood way. I found out that the author, Colleen Cross, is an accountant. That figures: The depth of the research in this book is way more than what you could get by Googling. An action-packed thriller about dirty money and diamonds! Katerina Carter is hired by Liberty Diamond Mines to find a large amount of money that is missing. Just as she begins breaking the service of what happened, bad things start to happen. Dead bodies begin showing up, someone is trying to kill Kat, and Kat finds herself in a race against time. As Kat begins to get closer to the truth, the more risky it gets. Can she figure out where the money went and who is responsible before they can catch An action-packed thriller about dirty money and diamonds! Katerina Carter is hired by Liberty Diamond Mines to find a large amount of money that is missing. Just as she begins breaking the service of what happened, bad things start to happen. Dead bodies begin showing up, someone is trying to kill Kat, and Kat finds herself in a race against time. As Kat begins to get closer to the truth, the more risky it gets. Can she figure out where the money went and who is responsible before they can catch up with her? This book was full of action. It was hard to put the book down because each chapter was one step closer to finding the truth. The author did a fantastic job with keeping the book suspenseful. I also really like the main character, Kat. She is a determined woman who isn't afraid to do the right thing, even when it puts her life in danger. I really enjoyed this book! In Exit Strategy, Colleen Cross weaves a gripping tale of international intrigue that links the world of high finance to diamond smuggling. Her story takes us on a wild ride as Kat, her witty and feisty investigator, races against the clock to recover billions of stolen dollars while evading the wrath of organized crime. This well-crafted thriller with nonstop action keeps you flipping the pages to the very end to find out what happens next! Katerina is a fantastically strong character. When she first takes the case to study the possible fraud at Liberty, she doesn’t think her discovery will land her in such danger. However, once she learns the truth, she refuses to give up, going so far as to risk implicating herself and her Uncle Harry in the This audiobook had all the bada** elements of a great action movie. There were falsified diamonds, high speed chases, murders, kidnapping, and a ton of other adventures packed into this book. Wow, wat een geweldig boek! Vanaf het eerste moment wordt je meegesleurd in een spannend verhaal over diamantfraude. Een echte aanrader! It’s got so much detail into the crimes & characters it must have taken ages to research. The diamond mines and the trading alone. Such a change from the Witchy books. I love them & loved this! The narrator was really good. Tempo spot and she kept the characters going so well. Really fab start to I’m hoping is a new series. Nooduitgang is een verhaal vol actie, theorieën waar hoofdpersonage Kat haar hoofd over breekt en duistere figuren. Het verhaal begint gelijk in een gedetailleerd beschreven donkere scène, waarbij je als lezer direct in het verhaal gezogen wordt, steeds dieper in je stoel kruipt, en met razend tempo door wilt lezen: hoe gaat dit verder? Hoe is dit zo gekomen en vooral: wie zit hierachter? Het verhaal loopt na deze scène als een trein. Er wordt veel uitgelegd over de gang van zaken en hoe het prec Nooduitgang is een verhaal vol actie, theorieën waar hoofdpersonage Kat haar hoofd over breekt en duistere figuren. Het verhaal begint gelijk in een gedetailleerd beschreven donkere scène, waarbij je als lezer direct in het verhaal gezogen wordt, steeds dieper in je stoel kruipt, en met razend tempo door wilt lezen: hoe gaat dit verder? Hoe is dit zo gekomen en vooral: wie zit hierachter? Het verhaal loopt na deze scène als een trein. Er wordt veel uitgelegd over de gang van zaken en hoe het precies zit met de aandelen en de diamanten, waardoor je ook als leek deze zaak heel goed kunt volgen. Gelukkig haalt dit de vaart er niet uit, integendeel! Juist omdat het zo uitgebreid wordt uitgelegd, begin je je er steeds meer je eigen weg in te vinden en leer je daarnaast de mensen van Liberty Diamond Mines stuk voor stuk steeds beter kennen. Er gaat ontzettend veel geld om in deze zaak en het lijkt wel of iedereen er iets mee te maken heeft. En dan is er natuurlijk de verdwijning van een van de kopstukken van Liberty Diamond Mines... De uiteenlopende personages die elkaar kennen vanuit Liberty Diamond Mines maken het elkaar ontzettend moeilijk, en willen het liefst allemaal buiten de schijnwerpers blijven om maar niet teveel op te vallen met hun eigen getrokken plannen. Wie is er eigenlijk echt te vertrouwen? Teveel weten is al funest, dat weten ze allemaal. Toch laat niet iedereen zich zomaar de wetten voorschrijven door een ander, met alle gevolgen van dien. Het is aan Kat (en de lezer, natuurlijk) om uit te zoeken hoe al deze puzzelstukken in elkaar passen en deze zaak zo snel mogelijk tot een goed einde te brengen. Kat is een pittige tante, die niet met zich laat sollen. Haar leven is op het moment zwaarder dan ze voor ogen had gehad en wil dan ook alles op alles zetten om geld binnen te halen met deze klus. Zodra ze merkt dat het duisterder en daarmee ook gevaarlijker wordt, keert ze zich het liefste af van de mensen die haar lief zijn om hen in veiligheid te houden. Zij weten namelijk niets over haar persoonlijke problemen en Kat wil en zal alles zelf oplossen, als het even kan, onafhankelijk als ze is. Toch laat ze op den duur haar opgetrokken muur steeds meer zakken, omdat ze doorheeft dat ze het in haar eentje gewoon echt niet redt - en omdat ze merkt dat haar eigenwijze karakter haar vaker in ongemakkelijke en benarde situaties brengt dan gedacht. Misschien geven deze mensen haar net het laatste beetje power dat ze miste (al baalt ze daar stiekem wel van, natuurlijk) om haar leven weer op de rit te krijgen én om tot de oplossing van deze vermissing en het verdwenen geld te komen. Nooduitgang is een vermakelijke thriller, die wegleest als een actiefilm door de vlotte en gedetailleerde schrijfstijl van Colleen Cross en die jou als lezer niet meer met rust laat tot je het boek hebt dichtgeslagen. De zaak die Kat op zich neemt is een huiveringwekkende zoektocht naar de waarheid, gevuld met onverwachte plottwists en interessante personages. Ik ben in ieder geval heel benieuwd naar haar volgende zaak, want ik heb zo mijn vermoedens dat Kat zich met deze zaak absoluut op de kaart heeft gezet als fraudeonderzoeker en dat zij nog grotere klussen zal gaan krijgen in de toekomst! In massive amounts of debt and wondering why she ever decided to start her own the forensic accounting business, Katerina (Kat) Carter is forced to live in her office space after being evicted for not paying her rent. As her world is about to completely unravel, Liberty Diamond Minds comes into the picture. Someone has embezzled five billion dollars and before going public with the information, the CEO hopes Kat can track down the money and save the company. But Kat quickly learns more than just money is at stake as she uncovers a global conspiracy involving “blood diamonds”, money laundering, and some of the most powerful people in the world. Colleen Cross' "Exit Strategy" starts with a heart pounding execution style murder in Argentina and the pace does not stop until the final page is turned. I would have never guessed that a book whose main character is a forensic accountant would be so engaging but this has all the elements of some of my favorite novels - entertaining, fast paced, real characters (with the possible exception of one of the more obstructionist police officials), and numerous plot twists. What I appreciated most was Cross' research and expertise regarding the world of underground trafficking, how organizations can launder money, and the use of the global diamond mining system to trade illegally without a trace. I don't think I will look at a diamond ring again without wondering if or how it may have played a role in some illegal activity. Cross provides just enough detail about how forensic accounting works to keep it interesting with the side benefit of illustrating just how challenging our own government and those around the world face in dealing not just with illegal trade activities but terrorists. This gave me an entirely new appreciation for what likely goes on behind the scenes everyday to keep the world safe. Cross has a gift for storytelling and I look forward to future works. Note: A complimentary copy of this novel was provided ini return for a review. Forensic accountant Katerina (Kat) Carter has her own new practice, but business is slow and she’s so broke that she is forced to live in her office. When she’s hired to find Liberty Diamond Mines’ missing $5 billion and its CFO, she takes the job, despite a couple of red flags and an impossibly short deadline. In Kat’s profession, little is what it seems at first glance. This time, the paper trail leads straight into physical danger. Exit Strategy is a riveting story about what happens when gree Forensic accountant Katerina (Kat) Carter has her own new practice, but business is slow and she’s so broke that she is forced to live in her office. When she’s hired to find Liberty Diamond Mines’ missing $5 billion and its CFO, she takes the job, despite a couple of red flags and an impossibly short deadline. In Kat’s profession, little is what it seems at first glance. This time, the paper trail leads straight into physical danger. Exit Strategy is a riveting story about what happens when greed mixes with organized crime. There are big stakes and big risks, and plenty of action as Kat scrambles to find answers. This mystery is a whodunnit from a violent crime perspective, but also a howdunnit from a white-collar crime perspective. In fact, the book opens with two separate stories in different parts of the world. Author Colleen Cross brings them together beautifully with great pacing and tension building. She also provides clear examples of how stock shares can be manipulated inside and outside a company. To say that Kat Carter is determined would be a huge understatement. She’s one gutsy character with a lot of depth and plenty of worries. For an amateur sleuth, she takes a lot of risks, however a woman struggling to survive, physically and financially, could go to extremes for resolution. Exit Strategy is Cross’ debut novel, and I look forward to more adventures with this intriguing character. 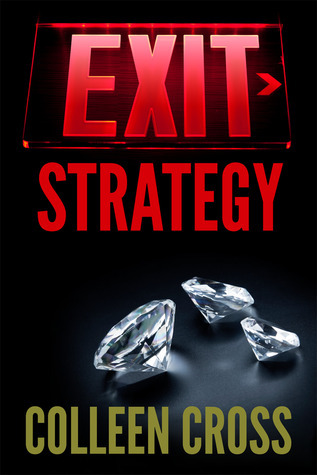 In Exit Strategy the reader follows forensic accountant Kat Carter on a international $5 billion fraud ivestigation. Cross pulls you into the story as Kat is immersed in the intriguing and dangerous world of blood diamond laundering. Once she has drawn you in, Colleen Cross keeps keeps you flipping pages in this a fast paced adventure by introducing many plot twists that will keep you guessing until the very end. I didn’t think it could happen but, by the time I finished reading EXIT STATEGY, I felt I understood the world of money laundering, big corporations and the role of forensic accountants in following the money. Five stars for EXIT STRATEGY and I’m looking forward to the next Kat Carter adventure. Seriously good story. Original protagonist & fun international plot. It seemed like a good story in the beginning but got more and more unrealistic. I'm surprised at all the praise. Who knew that forensic accounting could make for such a dangerous job, or for such an absorbing read. This very enjoyable thriller tells the story of Katerina Carter, forensic accountant turned PI who is asked by a large, local diamond company to investigate the disappearance of five billion dollars, and the Chief Financial Officer. Because of her own mounting debts, and the added burden of the buy-to-renovate mortgage that her ex-fiance wants her to share, she takes the job. There begins a compl Who knew that forensic accounting could make for such a dangerous job, or for such an absorbing read. This very enjoyable thriller tells the story of Katerina Carter, forensic accountant turned PI who is asked by a large, local diamond company to investigate the disappearance of five billion dollars, and the Chief Financial Officer. Because of her own mounting debts, and the added burden of the buy-to-renovate mortgage that her ex-fiance wants her to share, she takes the job. There begins a complicated, convoluted set of events, not helped by her well-meaning Uncle Harry, who, as her volunteer receptionist, seems to create more chaos than he resolves. With his help, and that of her kind and handsome ex-fiance, Jace, and her undercover police friend, Cindy, they uncover a plot which stretches from Vancouver to Argentina through trust accounts and share brokers to blood diamonds and international arms smuggling. This book begins with a chapter which is more prologue than part of the body of the story. For me, it was a little confusing, but I stuck with it and the information provided became very pertinent in later chapters, especially with regard to the motivations of the characters involved. accountant but at times it did seem like her character flaws were going to have fatal outcomes, either directly or by virtue of the criminals that she managed to annoy. Her saving grace was the wonderful people she had around her who frequently rescue her from danger, and from herself. My only minor quibble with this story was the technical explanations of stock market trading that Ms Cross provided through her lead character. I found the explanations hard to follow as they were full of jargon and assumed a prior knowledge of terms and procedures. I had to gloss over those in order to get to the story again. I note that Colleen Cross has written a three other books in this series, along with a couple of short stories. I am looking forward to sharing in Harry, Jace and Cindy’s frustrations and fears as they watch Kat Carter take on other seemingly impossible and deadly accounting conundrums. I also see that Colleen Cross has another murder mystery series, the Westwick Witches murder mysteries, which also look very interesting. This is the first book in the Katerina Carter Fraud series. Katerina is a forensic accountant - someone who reviews financial records to find the money. She is hired by a company who is suddenly missing millions of dollars and a CFO. The company is reluctant to inform the public/stockholders of the loss. Kat, who is really down on her luck and living out of her office, wonders why she I received this book for free. I am voluntarily leaving this review and all opinions expressed herein are my own. This is the first book in the Katerina Carter Fraud series. Katerina is a forensic accountant - someone who reviews financial records to find the money. She is hired by a company who is suddenly missing millions of dollars and a CFO. The company is reluctant to inform the public/stockholders of the loss. Kat, who is really down on her luck and living out of her office, wonders why she is being hired instead of a more prestigious firm. The firm doesn't count on is Kat's tenacity. The more Kat learns, the more the firm wants to keep hidden and the more dangerous it becomes for Kat. This was an intriguing mystery that's different than most thrillers in that you don't start with a dead body. Here, Kat has to figure out by deciphering financial anomilies and records which don't fit the expected norm. What seems to be a pretty straight forward problem - the missing money taken by the missing employee - blossoms into a much greater scheme when putting together all of the bits and pieces. The author has clearly done her research and taken what otherwise would be a dry subject be involving and compelling. This is the part of the story I really enjoyed. I also liked Kat and her Uncle, who really compliment one another well and I enjoyed their character development. Kat's former boyfriend was a bit flat and a bit of a doormat. Hopefully he will become stronger as the series continues. Wow, this is finally something different, most books follow a very similar story line, but in this case the author writes about a forensic accountant, I mean, what is that? it sounds so cool. So, into the audio book I go. It is not one of the longest in the world at 8 hrs and 51 mins. This is a good moment to say that I was offered and audible code for this book in exchange for a review. Thanks Colleen. There is a lot going on in the book, the action is fast paced, but not too much that you can g Wow, this is finally something different, most books follow a very similar story line, but in this case the author writes about a forensic accountant, I mean, what is that? it sounds so cool. So, into the audio book I go. It is not one of the longest in the world at 8 hrs and 51 mins. This is a good moment to say that I was offered and audible code for this book in exchange for a review. Thanks Colleen. There is a lot going on in the book, the action is fast paced, but not too much that you can get lost, the details and descriptions of the world of forensic accountant are wonderful, full of information for those who have no idea, like me. I have to say the research the author did is very good. As there is a lot of money at stake here in this book and this also means murders, mystery and also money trafficking, with lots more suspense thrown in. The main character is brought to life with the great character development that the author has written and as this book is the first in a series I imagine that you learn a little more about Kat in the other books also. Legal thrillers have never been high on my listening list, but this very one may just change that,I really enjoyed this one.From the very beginning the opening line ,the action came thick and fast, from then it just got better and better.I found Katerina, believable and a real tryer, I loved all the close relationships, which proves there is nothing more important than family, specially in such a story.I found the plot well written and twisty and turny, just when i thought I had a handle on the Legal thrillers have never been high on my listening list, but this very one may just change that,I really enjoyed this one. I received this as a free download in return for a fair review. Suspense with a splash of intrigue Katerina Carter is a forensic accountant hired to uncover money laundering plus tracing the sources of blood diamonds. Katerina tries to do good while not having an idea on maintaining her own safety. This is not the usual kind of thriller starting with a murder then working to solve it. The characters here include mobsters, diamonds, and murder. The plot is complex taking time to develop on the fi I received this as a free download in return for a fair review. It was so interesting and informative though. Who knew that blood diamonds can be traced back to source? Not me. I have a serious maths hangup and would normally never choose anything with statistics and accounting as part of the plot. Towards the end I was at the edge of my seat with Katerina transferring the money between bank accounts trying to hide it. The story was carried throughout by a great narrator. This book pulls together some quite extensive financial accounting details of the diamond trade, mob bosses, murder, kidnapping and makes a breathtaking chase against time. I was gripped by Katerina's investigation (even the numbers scenes whe Who'd have thought a story that is mostly about the mining and economics of diamonds could be so thrilling. Yet Colleen Cross pulls it off. I knew a little about blood diamonds (mainly from watching a movie and researching afterwards) but not a great deal. This story had a lovely depth of complexity to it, at first it seems Katerina has been hired to do a simple investigation but it soon becomes apparent that there is far more going on than it first seemed. The character development is incredibly well done all of the characters feel real and they all have complex thoughts and motivations. I loved Katarina, she's strong, stubborn, and driven, and as things he's up and what information comes to light she's not prepared to walk away even when that's t This story had a lovely depth of complexity to it, at first it seems Katerina has been hired to do a simple investigation but it soon becomes apparent that there is far more going on than it first seemed. The character development is incredibly well done all of the characters feel real and they all have complex thoughts and motivations. I loved Katarina, she's strong, stubborn, and driven, and as things he's up and what information comes to light she's not prepared to walk away even when that's the easy option, even when that's the safe option. Driven by the complexities of human motivation and human greed this book hold my attention from the first minute to the last. The narration was well done, the character voices were clear and consistent. The tone and pace of the delivery worked well with the tone of the book. Wow...I was not only pleasantly surprised by this story, but I was blown away! I’m married to a CPA and do quite a bit of financial reporting at my job so I was prepared for a bit of boredom. What I got instead was an infuriating young forensic accountant who, through her dogged pursuit, was able to solve a crime that involved an Argentinian arms/illegal diamond dealer, and a Canadian gang. Even after several attempts on her life, Kat never gave up. Lots of twists and turns and Kat’s side kicks, Wow...I was not only pleasantly surprised by this story, but I was blown away! I’m married to a CPA and do quite a bit of financial reporting at my job so I was prepared for a bit of boredom. What I got instead was an infuriating young forensic accountant who, through her dogged pursuit, was able to solve a crime that involved an Argentinian arms/illegal diamond dealer, and a Canadian gang. Even after several attempts on her life, Kat never gave up. Lots of twists and turns and Kat’s side kicks, Uncle Harry and Jace, are great in their own right. Great book and will definitely be delving into the rest of the series. Listened to this one on audible. I was familiar with Colleen Cross’s writing as I’d also listened to one of her Westwick Witches’ series too. The narration across the two was fairly similar and I actually liked the narration more in this book. Although, I did keep linking voices in this one, to that book. An intriguing tale of corporate fraud with twists a plenty. Never knew there was such a thing as forensic accountants and there was a lot of research into the diamond trade illicit and licit wi Listened to this one on audible. I was familiar with Colleen Cross’s writing as I’d also listened to one of her Westwick Witches’ series too. The narration across the two was fairly similar and I actually liked the narration more in this book. Although, I did keep linking voices in this one, to that book. An intriguing tale of corporate fraud with twists a plenty. Never knew there was such a thing as forensic accountants and there was a lot of research into the diamond trade illicit and licit within this novel. I learnt a lot. Colleen Cross writes exciting, intelligent thrillers and engrossing mysteries that grip you from the very first page. She took her very own "Exit Strategy" from the corporate world into the book world several years ago to indulge her bookworm wannabe writer self. She lives with her family on the West Coast. When she's not writing, she loves to run and explore with her rescue dog, Jaeger, who remin Colleen Cross writes exciting, intelligent thrillers and engrossing mysteries that grip you from the very first page. She took her very own "Exit Strategy" from the corporate world into the book world several years ago to indulge her bookworm wannabe writer self. She lives with her family on the West Coast. When she's not writing, she loves to run and explore with her rescue dog, Jaeger, who reminds her daily that life's too short to not follow your dreams--or a squirrel or two. Visit her website at www.colleencross.com and sign up for her twice-yearly private newsletter and be the first to hear of new releases and exclusive subscriber-only offers.